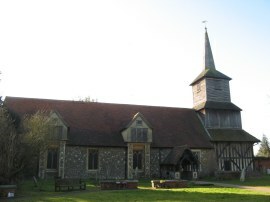 I did this walk on Saturday 25 February 2012. 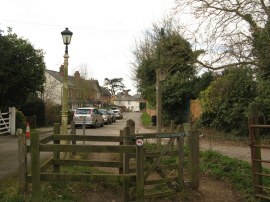 I drove over to Blackmore and was able to park in a very small layby directly opposite where the St Peters Way reaches the road in the village at the point where I had finished my last walk. (3) Don't abandon your motor vehicle here! On the map the route is marked as heading down the Ingatestone Road before joining a path on the right that heads down to St Laurence Church however having headed down the road the path on the right appeared to be a residential driveway, with no footpath marker, so I retraced my steps and headed up The Green. 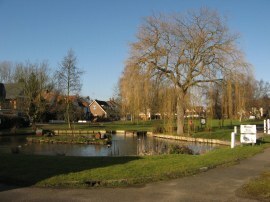 Here I passed by attractive village pond, photo 1, before heading to the left along Church Street, which not unsurprisingly leads up to the church, photo 2. Back on the marked route I followed the St Peters Way across a meadow down to the Blackmore Road. 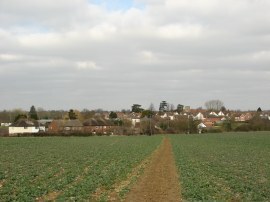 Here the route heads to the left for a short distance before joining a footpath that heads down besides the last house on the right. 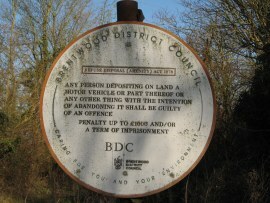 This runs along a short section of track, where there was a rather strangely worded notice regarding fly tipping offences, photo 3, before heading out into an open field. The route then heads across the middle of this field, photo 4, and over a small bridge before heading right for a few yards and then left along the edge of the next field. The path then continues over the next before heading to the left around the edge of a large barn at Plaslow Common Farm. I then headed to the right around the front of the barn and headed down the driveway to reach the Nine Ashes Road. I think I have mentioned before that my OS map of the area is quite old and since it was printed the route of the St Peters Way has been altered at this point, however with only intermittent way marks on the ground I was not aware of this and followed the old route. This headed straight across the road and along a driveway besides a house that bears round to the right to join a tree lined track, photo 5, which eventually leads out to a field edge path. This follows the field edge as it curves round to the right, heading slightly downhill into very shallow valley. 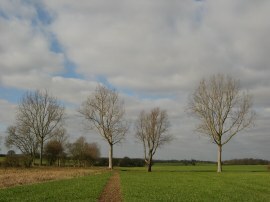 The footpath then continues ahead, now going slightly uphill, for a short distance further before heading to the left across the field on the left. This field had recently been ploughed and although there was a footpath marker pointing the way it made much more sense to back track slightly and head along the field edge at the bottom of the valley. Having said that, the soil was remarkably dry and I ended up following some tractor tracks across the field about halfway between the field edge and the actually course of the footpath. The day had started really bright and sunny but was now clouding over fast as I made my way across the long field and into the next. This field had been planted with winter wheat and the course of the path across it had been marked. This leads down to the trees in photo 6 where the revised route of the St Peters Way rejoined my route from the left. 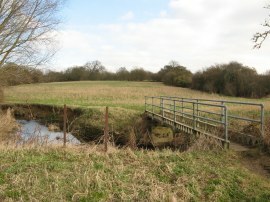 I then continued ahead along the field edge until I reached a small footbridge crossing the stream on the left. Here I then headed to the right along a stretch of path that heads uphill across the middle of the field, running parallel with some electricity poles to reach a farm track. Crossing over this the route continues ahead through a narrow band of trees and across another field that heads down to the village of High Ongar, photo 7. Here I headed to the right along Mill Road before joining a paved footpath on the left that heads round the edge of some houses before bearing round to the right to head down a short flight of concrete steps. 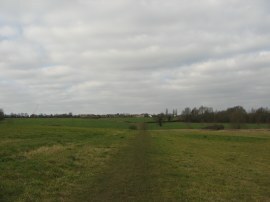 These lead to a short stretch of scrubby ground before the footpath heads out across a field of grass along a path, photo 8, which is followed down to Clatterford Bridge which carries the path over the River Roding. Once over the bridge the route heads to the left along the overgrown banks of the river before heading uphill to the right along the edge of the next field. 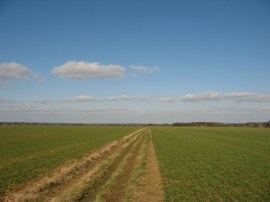 Reaching the top of the field the route links up with that of the Essex Way and heads to the left along a broad path that is followed round the outskirts of Ongar to reach Castle Street, photo 9. There was a way mark for the St Peters Way on the footpath marker by the gate at the top of the road, the last one I saw on the route. 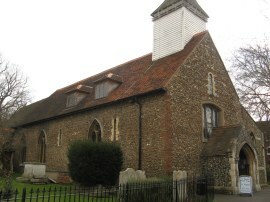 I then joined a walled path on the right that leads down to St Martins Mews, past St Martin’s Church and on down to Ongar High Street which I made the end of the route. 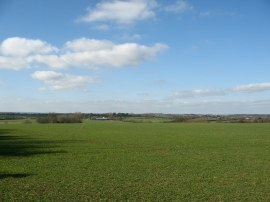 At this point I had walked exactly 5 miles from Blackmore which made the entire St Peters Way 42 miles long. Unlike many other parts of this walk there were numerous options available to form a circular walk back to the car which made for a very pleasant days outing, particularly as the weather brightened up once again for the remainder of the day. 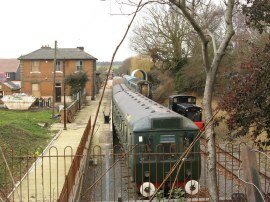 I headed up the High Street, passing the Epping Ongar Railway, photo 12, and continued on across the A414. I then headed along the B184 before joining a driveway on the left which I followed up to St Peter's Church, Shelley, photo 13. 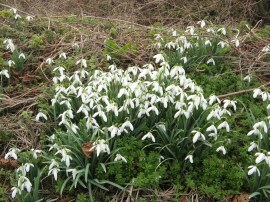 In the churchyard there was a large carpet of snowdrops amongst the gravestones, photo 14. From the church I continued on besides fields up to the small group of houses surrounded by their moat and Bundish Hall and then up to Cross Lees Farm. Here I joined a footpath on the right, running between barns full of cattle to join another footpath heading between fields which leads up to the Ongar Road at Clatterford End. Crossing the road I continued ahead to link up with the route of the Three Forests Way which I followed round to Herons Lane and Tun Bridge, photo 15. I had walked the Three Forests Way many years ago and wondered if it had been way marked as the signage for both the Essex Way and St Peters Way had been considerable upgraded since I had first walked in the area however the route still appears to be unsigned. Crossing the bridge I briefly linked up with the route of the Essex Way as it headed up towards Cannon's Green before joining a footpath on the right that run round the edge of a large open field with good views back across the countryside I had just walked, photo 16. 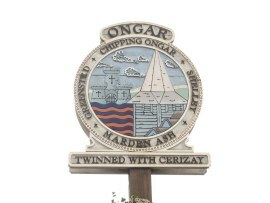 I then joined a track which I followed round three sides of what was once the site of the WW2 Chipping Ongar Airfield. 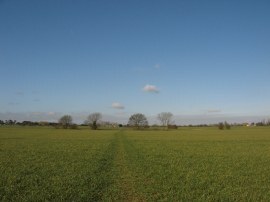 This included one very long straight stretch of path running between fields, photo 17. Eventually i left this track, joining a footpath that headed off to the right, soon joining a track, which I followed down to Norton Heath Road. Here I again continued ahead along the quiet country lane before joining a byway, Lucas Lane, on the right, just after the road had headed sharply round to the left. I followed this before joining the first footpath on the right, where there was a footpath sign with an Essex Way way mark attached, although the nearest part of the Essex Way was in fact several miles away! 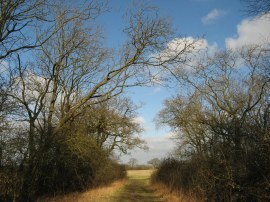 This footpath makes its way down over fields to the A414 road. I had been a bit unsure about the next few yards as I had to walk to my right along the road for a short distance before joining my next footpath on the other side of the road however reaching the road I was pleases to see that there was a wide verge to walk along with the remains of a tarmac path just about visible underfoot. 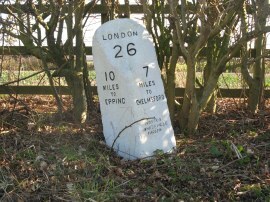 Besides the footpath was an old style distance marker stone, photo 18, which was nice to see. I had a short sit on the stile besides the road, enjoying the warm sunshine, before following the footpath around some field edges to Fingrith Hall Road. Heading across the road I then joined another footpath running between more fields which leads down to Nine Ashes Road at the outskirts of Blackmore from where I just had a short walk through the village back to my car. As usual I have uploaded the route of the walk which can be accessed here: St Peters Way Stage 6 Route. So that is the St Peter's Way completed. 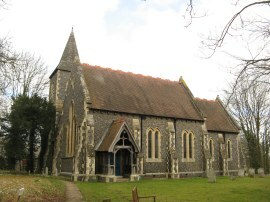 Not a classic walk but with a few interesting parts on the way, particularly in the area around Mundon and it has kept me nicely out walking during the winter months without having to travel too far from home.